I don't know who first thought of adding dried red cranberries and green pistachio nuts to a cookie dough but it was a brilliant idea. It makes us all look so clever during the Christmas season, serving a plate of red and green flecked shortbread cookies to match all our red and green decorations. As you may know, shortbreads are the quintessential Christmas cookie, starting out in Scotland as a Christmas and New Year's Eve (Hogmanay) treat. The Scots really got this cookie right, and we are only going to enhance it here with these buttery shortbreads by adding dried cranberries and crunchy pistachios. It is no surprise that shortbreads moved from being simply a Christmas cookie to a year round favorite. With their buttery flavor and crumbly texture, this cookie (biscuit) is hard to beat. All shortbreads, including these Cranberry Pistachio Shortbreads, have three main ingredients, butter, sugar, and flour. So with such few ingredients, we must try to use the best we can afford. First, a really great tasting shortbread needs a great tasting butter. Butter in the States is graded according to flavor, color, texture, aroma and body and one way to tell the quality of the butter is by the letter code or numerical number listed on the butter's package. The highest grade is AA (93 score), then A (92 score), followed by B (90 score). You can also find European style butters that have a higher fat content which you can use to make your shortbreads. Another important ingredient in shortbreads is vanilla extract so use a good quality "pure" vanilla extract. Stay away from the ones labeled "imitation" vanilla extracts as they are made with synthetic vanilla and leave a bitter aftertaste. As the name 'Cranberry Pistachio' Shortbreads implies, we are also adding dried cranberries and pistachio nuts to the shortbread batter. Dried cranberries are soft and chewy with a sweet tart flavor and they can be found in most grocery stores as well as health food stores. The pistachios I use are unsalted natural pistachios, not the ones that have been dyed red. I like to roughly chop both the dried cranberries and the pistachios so you get small chunks, not large pieces, in each cookie. 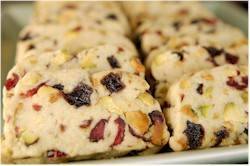 Cranberry Pistachio Shortbreads: In a large bowl whisk the flour with the salt. Using a sharp knife, slice the logs into 1/4 - 1/3 inch (.5 cm) thick cookies. Place the cookies on the prepared baking sheet, spacing about 2 inches (5 cm) apart. Bake for about 15 - 20 minutes, or until the cookies are just beginning to brown around the edges. Remove from oven and cool on a wire rack.